Safetots are open to answer customer enquiries from Monday to Friday between the hours of 8.00am to 6.00pm. All orders placed and all enquiries sent after 6.00pm on Friday and before 8.00am on a Monday will be processed on Monday. 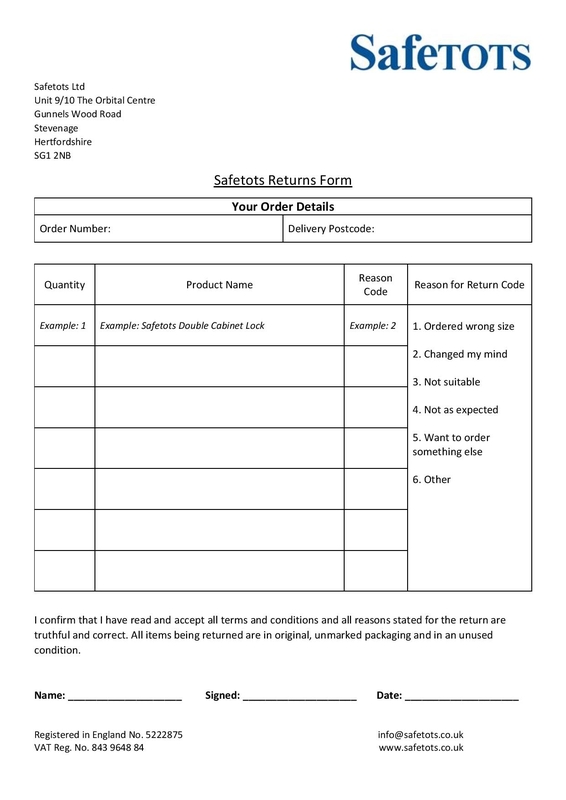 Please note all returns to Safetots MUST have the printed and completed Safetots Returns Form or a refund cannot be issued. All items returned to Safetots WITHOUT the completed Returns Form will be disposed of as second-hand goods. If your goods arrive faulty or develop a fault during use please contact Safetots straight away with the details. We can then contact the manufacturers and if a fault is established, a replacement will be issued. If the item you have purchased from Safetots develops a fault up to 6 months of purchase, under the Consumer Rights Act of 2015 and ICACs Regulatons of 2013 you are entitled to a repair or replacement of the product. As long as the product has not developed a fault due to fair wear and tear, accidental damage or misuse, Safetots will arrange for the item to be repaired or a replacement item to be sent to you within 7 days. If we should receive a complaint about any part of our service, by phone, fax, email or letter, then it will be dealt with promptly (we will reply within 5 working days). It will then be dealt with confidentially, and effectively. Safetots is obliged under these regulations to offer our customers free take-back of their WEEE on a like-for-like basis when they buy a new Electrical or Electronic product from us. ANY WARRANTIES OF TITLE OR WARRANTIES OF MERCHANT ABILITY OR FITNESS FOR A PARTICULAR PURPOSE. THIS DISCLAIMER OF LIABILITY APPLIES TO ANY DAMAGES OR INJURY CAUSED BY ANY FAILURE OF PERFORMANCE, ERROR, OMISSION, INTERRUPTION, DELETION, DEFECT, DELAY IN OPERATION OR TRANSMISSION, COMPUTER VIRUS, COMMUNICATION LINE FAILURE, THEFT OR DESTRUCTION OR UNAUTHORIZED ACCESS TO, ALTERATION OF, OR USE OF RECORD, WHETHER FOR BREACH OF CONTRACT, TORTUOUS BEHAVIOUR, NEGLIGENCE, OR UNDER ANY OTHER CAUSE OF ACTION. CUSTOMER SPECIFICALLY ACKNOWLEDGES THE SERVICE IS NOT LIABLE FOR THE DEFAMATORY, OFFENSIVE OR ILLEGAL CONDUCT OF OTHER CUSTOMERS OR THIRD-PARTIES AND THAT THE RISK OF INJURY FROM THE FOREGOING RESTS ENTIRELY WITH CUSTOMER.